1) Increased energy density over lead batteries: the high-power batteries of the Torqeedo Power range are lithium based and, hence, have an enormous energy density. This is a decisive advantage when you consider the limited volume and weight in the boat. There are also significant advantages over heavy lead batteries when it comes to handling. They are also higher energy density than other lithium battery types such as Lithium Iron Phosphate—see story about Solar boat project for comparison. 2) Improved tolerance to high current: conventional batteries can only provide a fraction of their nominal capacity in the case of load in the typical power range of larger electric motors. Torqeedo Power batteries, on the other hand, can deliver their rated capacity, or close to it, even at high discharge rates. 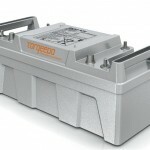 3) Higher charge stability: Torqeedo Power batteries remain charged for several months even when they are stored. This is particularly important for the use of the electric drive as an auxiliary motor. In this respect too, they are way superior to conventional batteries. 4) Improved performance in the cold: lead batteries perform poorly at cold external temperatures. The Torqeedo Power, on the other hand, releases cloase to its full power even at cold outside temperatures. This is a tremendous advantage should an electric motor be required for winter use. 5) Improved built-in protection: lead batteries are really dumb batteries—they require external management systems to perform their best and protect from inadvertent mishandling and. The Torqeedo Power, on the other hand, has a string of built safety and protection features. There is an auto cutoff in the case of full immersion, as well as built-in protection against overcharging and over discharging. 6) Higher safety standards than all other lithium-based battery systems: the LIMA lithium-manganese cells used by Torqeedo are currently the only lithium batteries which also withstand all safety standards when the safety electronics are switched off. 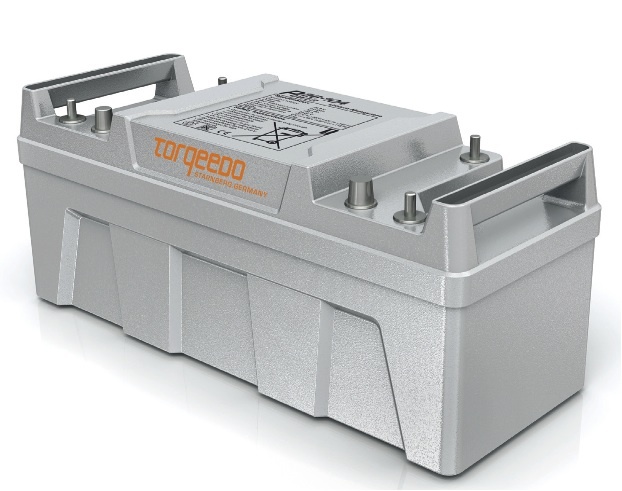 Nevertheless, each and every cell of the Torqeedo Power battery has its own safety mechanism. Torqeedo is the first provider to make the LIMA cells available for boat drives. Torqeedo Power 26-104 can be charged in eight hours using the standard Torqeedo charger (available separately) through the charge channel. They can can also be charged at a high rate through the discharge channel. If you have a need for high charge rates up to 100 amps, please call or write for details of how to go about this. I have a 801 Base Travel, and would like to use a 26-104 battery for virtually an unlimited range on a small 10’ row/fishing/tender. For better trim in the water, I’d like to place the battery in the bow. To accomplish this, would it be possible to use 6-gauge duplex cable and Marinco plugs/receptacles (my boat has built-in conduit and Marinco receptacles) to connect the battery to the motor? Cable run is about 12 feet in length including all bends and curves, with a total length of 14′ from motor to battery terminal. Is this set-up adequate for running the motor? (I don’t want to take a chance of damaging the motor with a longer cable run/resistance). I have a torqueedo 2.0 RS/LS on my 20′ pontoon since March. i have 4 AGM gel batteries Deka deep cylce Marine, but run out of juice after being on the lake for 3 hours, with max wattage output controlling about 1500 or less. I am looking at a comparision chart between AgM gel batteries and the Lithium Power 26-104 you sell. Secondly, what does the capacity (top number) really mean? Is it what the computer “assumes” what the battery status is or does the computer get live feedback from the battery? The reason I am asking, I came back to the dock today with 39%, but the batteries where still at 11.4 V measured under load with a battery tester, which showed “good” but border line. Just shoot me an e-mail or give me a call here in North Carolina 828-625-1459.